Luraville, FL--The Fellow Travelers Memorial Day weekend has become a tradition. It conflicts with the Florida Folk Festival at White Springs so Roy Moye and the Lippys elect to go to the festival so they can have a larger audience for their nonsense. But fourteen paddlers including two rookies did make the trip. Put-in was to be at 8:30 but Art and Janice Shelfer were late. Art took a wrong turn even though he had been to the launch site a bunch of times prior. Darell Dunn, Kyle Griffin, Noah Stines, and Charlie Stines pulled a trailer loaded with six canoes and made it there early, but Jeanne Hewetson was the first to arrive. Shortly afterward Daniel Butler and Liset Cruz came from Tallahassee, Greg and Sean Ferrell came from Pensacola, John Williams came from Plains, and Melissa Royal came from Albany. George Royal rode with Art and Janice so he was late, too. Once Art arrived most of the cars were shuttled to Branford for the take-out, but John’s bright red Suburban was left at the gate to the Suwannee River Water Management’s river camp at the Adams Tract. The cooking gear and community meal supplies were in his vehicle. Roy Moye had called Art an complained about the weather the folk festival was experiencing on Friday, but the Weatherman ordered a near-perfect Saturday. The blue sky was full of fluffy cumulus clouds and there was not a threat of rain. The temperature was plenty warm but not oppressively hot. 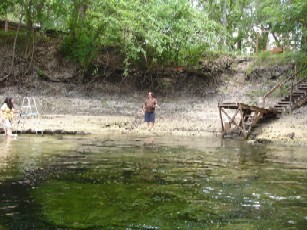 The river was rather low which meant that the springs were clear but not full. There were more shoals because of the lower water level but none were dangerous or even challenging. Jeanne wanted to try her hand at soloing and it tried her at first. John brought a pretty bright red Mad River Freedom for her. It took Jeanne a while to learn the steering and e specially the keeping it straight, but she became more adept as the paddle wore on. Darell Dunn made his first trip and used a 15’ aluminum Michicraft which had not been used for about fifteen years. Before the trip he discovered a few leaks but sealed them with epoxy. It worked well and he managed the tandem canoe as a solo expertly. Daniel Butler brought Liset Cruz for her first Fellow Traveler encounter. They used a Discovery 169 which had been relabeled Score 69. Kyle Griffin and Noah Stines took the green Tripper. John soloed his white Mad River. The Ferrells used the Penobscot 16, the Royals the Penobscot 17, the Shelfers used the Canadienne, and Charlie soloed the Prism. The first stop was at Telford Spring. Several took in a little swimming. Noah, Kyle, and Sean seemed to really enjoy it. Telford is now posted but it seems to be well-used in spite of the signs. After leaving Telford the paddlers headed downstream. There was a stop at the Peacock Slough River camp. Several appreciated the nice clean restrooms. Mr. and Mrs. Rice remembered the group well from the Thanksgiving outing. The next stop was at Running Springs. The spring was clear but very low. Some families were camping at the site. Again, the boys took advantage of the cool water and did a little swimming in the spring. The rookies were impressed by the old swinging railroad trestle that still stands open in the river just past the spring. Although everyone stopped at Bathtub Spring it was disappointingly low. It appeared that someone had pulled the stopper from the bathtub. 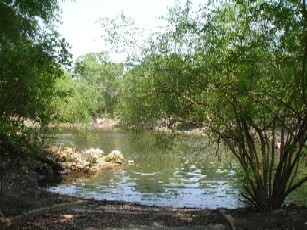 Lunch was at River Rendezvous at Convict Spring. The spring was higher than it was the last trip. Liset, Kyle, and Noah all swam some in the spring. There was a small crowd at the spring but it was a good place to eat lunch. It was nearly two by the time the travelers headed downstream. 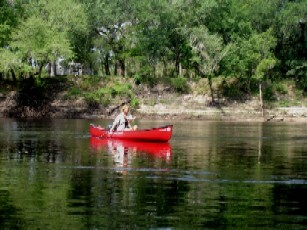 The Suwannee is not the best river to see wildlife. There were a few ducks, great blue herons, vultures, egrets, and songbirds. Daniel and Liset stopped at a little spring called Mud Flat Spring and saw a nice pileated woodpecker. There were lots of sturgeon jumping. Royal Spring is not far downstream from River Rendezvous. It was the largest spring encountered on Saturday. Again, some of the paddlers tried out the cool waters. 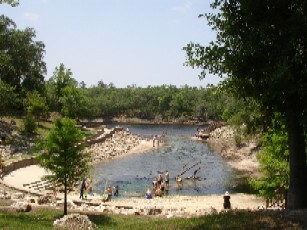 The spring is now a county park and it attracts crowds on holiday weekends. It is only equipped with porta-johns. The boat ramp is busy. The next stretch of river was shallow and there were several small shoals. Despite that, the motorboats and jet skis were becoming more frequent. The river banks are dotted by numerous cabins and vacation homes but the scenery is still good. There was a stop at Mearson Spring. This is a small but deep spring located on the right (west) bank of the river. The water was especially clear. It, too, provided a place for those wanting to swim. The Adams Tract River Camp is less than a mile downstream from Mearson Spring. The ca noeists began arriving shortly after 4:30. Almost everyone tied their boats securely and used the camp wagon to haul the camping gear to the campground. Some elected to sleep tentless in the screened platforms and others elected to pitch tents in the grassy areas. T]he camp host, Bruce Harmon, took John to the gate to retrieve the Suburban with the food and cooking gear. 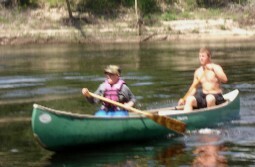 Kyle took John’s solo canoe and paddled upstream for another swim in Mearson Spring. Greg and Sean fished. Sean proved to be the better fisherman since he caught three keepers and Greg caught none. However, on Sunday Greg did finally manage to catch one large enough to keep. The King prepared a low country shrimp boil and it was praised. John cooked two pineapple upside down cakes in Dutch ovens and they were not only praised, they were devoured. The camp hosts shared the supper. 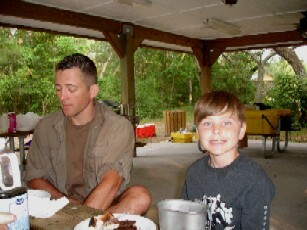 Calvin and Carol Stines (Noah’s parents) were returning from a cruise and stopped at the camp to share supper. Unfortunately, Noah had not seen his parents in a week while they had been in the Caribbean so he decided to go home with them rather than spend the night and canoe on Sunday. Kyle built a campfire and everyone except Darell sat around telling lies and toating marshmallows until about eleven. Darell went to bed at least an hour earlier. There were some Boy Scouts fro Jacksonville camping there and they were pretty well-behaved. They helped carry the travelers’ gear from the boat ramp. It was a wonderful night for sleeping in the woods. There was a neighborhood owl but he kept no one awake. Charlie’s nephew, Keith Webb, had suggested Charlie buy a Big Agnes sleeping pad. It was a good major award and is much easier to tote than a roll-a-cot. Darell and Charlie got up early. Charlie made fifty cups of coffee in the electric urn and only a little of it was poured out. Darell cooked sausage and grits, and Art cooked yellow eggs. Darell brought one of his famous pound cakes and it was very good. Melissa washed the dishes as penance for neglecting to share her chocolate Whoppers with others. After breakfast the gang packed the gear and headed out to load the canoes. Kyle left early so that he could reach Troy Spring ahead of the crew. Janice noticed the Canadienne was missing. Art swore the tied it up securely but then people do tell lies on canoe trips. The mystery was did it float away or did someone steal it. Daniel really insulted Charlie by asking why anyone would steal that canoe. The Canadienne is by far the fastest and easiest paddling boat Charlie owns, not to mention the most expensive one. Charlie let his boat get away while fiddling with the GPS and John paddled out to bring it in. He managed to flip his own solo after rescuing the Prism. Art rode with Darell and Janice sat in the middle of the Penobscot 17 being used by the Royals. Everyone was in search of the missing canoe. Hope was sinking and Charlie was secretly crying when Art spotted the canoe placidly sitting on the east bank of the river. Even Art’s double-bladed paddle was in place. Troy Spring was less than a half-mile from the spot the wandering Canadienne was found. The spring was clear and had plenty of water--and plenty of people. The paddlers made a long rest stop and several went in the water. After leaving Troy the motorboat traffic became heavy. Several were pulling skiers and even those who were not seldom slowed for the canoes. It was a harrowing experience to try to maneuver the wake from one boat while another was approaching at a fast rate. But everyone survived. The group arrived at Little River Springs around noon. It was a good place for lunch. Like R oyal Spring, it is a county park equipped with porta-johns. The spring is beautiful and it attracts not only swimmers and sunbathers but also a lot of divers. It has picnic tables and lots of pretty trees. It also has a lot of fast boats. 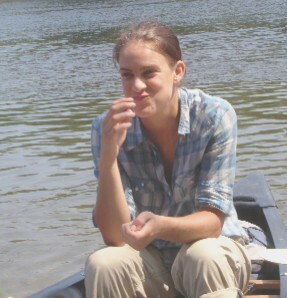 One came by as Jeanne was coming ashore and created a wake which came in over the stern of the solo canoe causing her to almost overturn. The boat filled with water. She was the usual good sport. Art suggested finding a way to Branford to get the cars because the canoeing was getting a little dangerous because of the motorboats. However everyone decided to paddle on to Branford. The traffic between Little River Spring and Branford was not as heavy as between Troy and Little River. The destination was reached safely. Once the paddlers had all said their good-byes they left tired but happy. It was a good trip.